Reimagined by AV Homes, Vitalia at Tradition in Port St. Lucie is a gated active adult community located within the larger master-planned community of Tradition. As Tradition’s only age-restricted community, Vitalia welcomes those 55 and better seeking an engaging lifestyle that enriches the mind and the body. Located along Florida’s Treasure Coast, Vitalia is just a short drive from some of the state’s most beautiful beaches. Just over 450 acres of lush palms and vista, Vitalia offers a variety of floorplans with fantastic resort-style amenities to complement the ultimate active adult lifestyle. Opened in the summer of 2014, the Captiva Club is a grand addition to a flourishing community. Designed as a catchall recreation center, this 24,000 square-foot lakefront facility is the hub of all Vitalia vim and vigor. Featuring a ballroom, fitness center, arts and crafts room, aerobics studio with modern Fitness On Demand technology, billiards and dart rooms and a catering kitchen, the Captiva Club is a perfect complement to an active lifestyle. Outside amenities span to include a resort-style pool for lap or leisure with poolside cabanas, eight pickleball courts, two bocce ball courts, and five tennis courts. There is also an event lawn with firepits, a lakeside pavilion, and a putting green. Active adults can enjoy the great outdoors with numerous walking and biking trails that intertwine within the community that will allow them to appreciate the beauty of Vitalia during their scenic strolls. The community was originally started in 2006 by Levitt & Sons who completed approximately 200 homes. The community was acquired by AV Homes in 2010 who are still building new construction with plans to have a total of 1,200 homes. Some of the original Levitt & Sons homes are now available as resales. These models range from 1,400 to 2,907 square feet of living space with two to five bedrooms, two to three bathrooms, and an attached two-car garage. These homes also feature low-maintenance exteriors great for active adults. Vitalia homes are thoughtfully designed to maximize space without sacrificing comfort and style. There are a variety of exciting floorplans, ranging in size from 1,460 square feet to 2,582 square feet, and reveal sun-washed great rooms, gourmet kitchens, expansive master suites and luxurious bathrooms. Many homes feature a study, a fantastic versatile room suited to fit individual needs. Expansive outdoor living areas create alternative spaces for relaxing or entertaining, taking advantage of the spectacular views. The AV Homes models feature two to four bedrooms, two to three bathrooms, and attached two-car garages. Resident clubs, sports and events flourish at the new 24,000 square-foot clubhouse, Captiva Club. With a variety of classes in yoga, stretch, silk painting and more offered weekly, residents are able to enjoy multiple pursuits. Full-time activities directors are on-hand to keep the pace going within the community coordinating pool parties, day trips and bringing the best live entertainment to the Grand Treasure ballroom. Resident groups include such interests as photography and book clubs to golf outings and bowling nights. Shaped by fun and friendship, these clubs and events bring together the Vitalia community creating a sense of camaraderie and close-knit neighborhoods. With bicycles and golf carts preferred mode of transportation, residents can join friends within the neighborhood or explore the vast 8,300 acres of Tradition. The on-site activities director keeps the calendar packed year-round full of great events and experiences all. Vitalia at Tradition has taken the art and science of resident planning to new levels. The Town of Tradition has an unmistakable small town feel with great restaurants, boutiques, spas, salons and many other conveniences. At the center of Tradition life is Tradition Square where the community gathers for year-round live entertainment, festival and special events. Home to the New York Mets spring training season, Tradition Field is host to dozens of baseball games including our local Florida league, the St. Lucie Mets. Enjoy the close proximity of the PGA Village where golf enthusiasts can take in rounds of championship golf or master the game at the PGA Center for Golf Learning and Performance. As the area’s newest medical facility, Tradition Medical Center features state-of-the-art technology and is a wonderful addition to the award-winning Martin Health Care System. This lovely gated community also enjoys convenient proximity to I-95 and the Cross Town Parkway. There is easy access to the surrounding area including the Atlantic Ocean and West Palm Beach, both less than 40 minutes from Port St. Lucie. 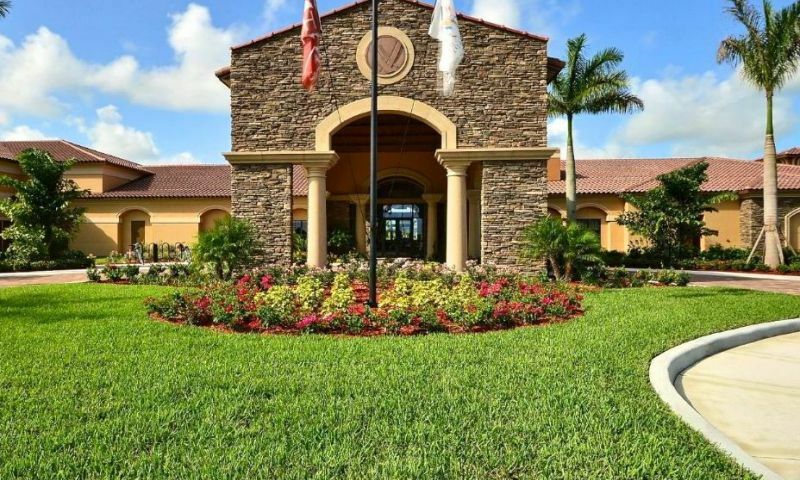 As Tradition’s only gated 55+ community, residents enjoy the nearby conveniences and family atmosphere offered just outside the Vitalia gates in the community of Tradition. The Captiva Club features a variety of amenities for residents to stay active and social. Captiva Club - 24,000 Sq. Ft. The Neighborhood Center is a meeting space for residents. There are plenty of activities available in Vitalia at Tradition. Here is a sample of some of the clubs, activities and classes offered here. The Tuscany Series began construction in 2006 by Levitt & Sons. These models are available as resale only. These homes feature two bedrooms, two bathrooms, and a two-car garage with 1,400 square feet of living space. Construction on the Island Collection began in 2012 by AV Homes. These single-family homes range from 1,460 square feet to 1,713 square feet. These homes feature two or three bedrooms, two bathrooms, and an attached two-car garage. The Spring Tide Series began construction in 2006 by Levitt & Sons. These models range from 1,508 to 1,695 square feet and are available as resale only. These single-family homes have two to three bedrooms, dens, two bathrooms, and an attached two-car garage. Garden Collection single-family homes offer 1,596 to 1,747 square feet of living space. They have two bedrooms, two bathrooms, and an attached two-car garage. The Summer Breeze Series began construction in 2006 by Levitt & Sons. These single-family models are available on a resale basis. They range from 1,713 to 2,418 square feet. These homes feature two to four bedrooms, two to three bathrooms, and an attached two-car garage. The single-family homes within the Beach Collection were built in 2012 by AV Homes. These homes feature two or three bedrooms, two bathrooms, and an attached two-car garage. These homes range in size from 1,771 square feet to 2,037 square feet. Single-family homes within the Classic Collection offer 1,992 to 2,229 square feet of living space. These homes have two or three bedrooms, two bathrooms, and an attached two-car garage. Construction on the Coast Collection began in 2012 by AV Homes. These single-family homes feature two to four bedrooms, two-and-a-half to three bathrooms, and a two-car garage. These single-family homes range from 2,111 square feet to 2,456 square feet. The Fall Mist Series began construction in 2006 by Levitt & Sons. These single-family homes are availabe as resale only and range from 2,214 to 2,907 square feet. These homes feature two to four bedrooms, dens, two to three bathrooms, and an attached two-car garage. Single-family homes within the Estate Collection offer spacious and open floor plans. They have 2,289 to 2,582 square feet of living space and have three or four bedrooms, two to three bathrooms, and an attached two-car garage. We could not have made such a big move across many states without her excellent help and advise ! We look forward to many wonderful years in our new home in Florida! Every time we drive into Vitalia, we find it hard to believe this is our new home ! The residents we have met are so friendly. This is extremely important to us because we left a lot of good friends behind in Minnesota. I would also like to thank our sales rep Kimberly Kirkman. She was extremely instrumental in our making the right decision, and I have never met a more friendly person than Kimberly. My wife and I are extremely excited about our home that is currently being built in Vitalia at Tradition. The community is absolutely beautiful and the people are very friendly. As transplants from California, Florida brings us closer to family and central to some amazing cities and landmarks that we look forward to exploring. Of all the places in the world that we have been and could have chosen to call home, Port Saint Lucie checks all of the boxes for us. We look forward to giving you a warm hello and smile. We looked at many homes in the Port Saint Lucie area and was very impressed with the quality and beauty of the Vitalia community and homes. This was the only community that we could find that is building new homes in a 55+ community. We originally looked at teh Cascades but the homes seemed old and tired compared to what Vitalia was offering. The home we bought has granite counter tops, a 2 car garage, arched door ways, high ceiling, terracotta roofs, and hurricane impact windows. The streets are landscaped with lush plants, palms, yuccas and pretty flowering shrubs. There must be a wild life preserve close by since we see cranes and other wild life from time to time. The clubhouse is temporary but they are building a new 25k sq. ft. one on a lake with all the amenities you would want. The best aspect of this community are the people who live here. Everyone waves and is extremely friendly. Taxes are a little on the high side but with homesteading they are reasonable and HOA fees are very reasonable compared to other communities we looked at. If there is a tree or shrub you want trimmed you just call the management company and they send someone out. No more outside work. We have more time to shop, play tennis and bowl. My sister and husband are now looking into moving into the community. It's a great place to live and very close to shopping and a new hospital that is being built. The community is in the town of Traditions which is very new and immaculate. We love it here and glad we made the move. The grounds keepers also do a great job of keeping our property nice. Last but not least we went on weather.com and checked out the average temps for they year. The average high never dips below 70 and the average high is never more than 90. With a little less rain we would be in paradise. Vitalia is one of the nicest 55+ communities I looked at with my mom. Traditions is a new community and is beautiful. Once the market swings back these homes will rise in value. The new homes being built are spectacular. I know my mom will be very happy here and prices are still very affordable. The HOA includes maintenance, cable, internet, alarm monitoring and water for the sprinklers. 55places.com is not affiliated with the developer(s) or homeowners association of Vitalia at Tradition. The information you submit is distributed to a 55places.com Partner Agent, who is a licensed real estate agent. The information regarding Vitalia at Tradition has not been verified or approved by the developer or homeowners association. Please verify all information prior to purchasing. 55places.com is not responsible for any errors regarding the information displayed on this website.